1929 Monarch Cottage Lg Private Park-Like Back Yard 1 Blk from Shakespeare Fest. Surrounded by pioneer homes and charming Bed and Breakfasts, this Wonderful, clean, cottage was originally built in 1929. Available only for a limited time over the summer, it features 3 bedrooms with antique furniture. The bathrooms have been updated and feature granite counters. Great get-a-way home to relax and enjoy Southern Utah and all it's beauty. Beautiful 1/2 acre backyard to enjoy with a large private parking area to keep your car(s) off the street. Perfectly located in Cedar city. One block from Historic Main street and Shakespeare Festival. Two blocks to SUU campus. 1200 square feet of space with 3 Bedrooms & 1 bath. For the comfort of all our guests, our Cottage, as well as, the entire property, is non smoking and pet-free. Our cottage has limited availability over the Summer so we can maintain the charm and integrity of the property. Traveling back and forth from SLC to home I always seemed to stop in Cedar City. I fell in love with the beautiful red rocks and friendly atmosphere. It also has a great energy because of the university and the many festivals, hence the term, Festival City." In 1988 I bought my first home which was located across the street (now called Amid Summer's Inn). This was before the street transformed into Bed and Breakfast Row. After eight years of ownership it was time to focus on raising a family so I sold it. In 2005 I had the opportunity to again own property in Cedar City so after three years of looking I found 149 South 100 West. They say not to get too attached to a home but something inside told me I needed to "save" this house from a bulldozer. The charm of this 1929 Depression Era house took hold of me and I embarked on restoring it with as much of the original design as possible. The name "Monarch Cottage" came to me as I was driving home to Los Angeles after a long weekend of fix-it projects. The crew that replaced the front door found a beautifully preserved butterfly in the original 1929 front door threshold. They said it was so perfect someone had placed it there on purpose. I took this a sign that this home was transitioning from its old life to a new one. With that in mind, the goal was to maintain the original integrity of the home yet fill it with hope of a new beginning. We have a private, park-like back yard with BBQ that allows guests to enjoy the beautiful summer sunsets. Our home is only available for a limited time during the summer season to insure the charm and integrity of the property. Phase one of our restoration was to upgrade the house. Phase two was all about designing our backyard, which was originally filled with waist-high weeds. Phase three, which is still in the planning stage, will develop the very back yard area. There are 2 Queen beds and 1 day bed to comfortably sleep up to 5 adults. Max adult guests 5. Downstairs there is an additional bath and laundry. Portable crib available. Cable TV, DVD player, iPod docking station, wifi. Kitchen has granite counters and is equipped with microwave, oven, refrigerator and kitchen supplies. Hair dryer. Other amenities; Iron and ironing board, sound machines, library, board games, rocking chairs and propane BBQ. Cottage is cooled by central air and ceiling fans. We have a strict NO SMOKING and NO PETS policy on the entire property. Well behaved children welcome. Please call owner before booking to make sure Monarch Cottage is perfect for your needs 818-395-4747. 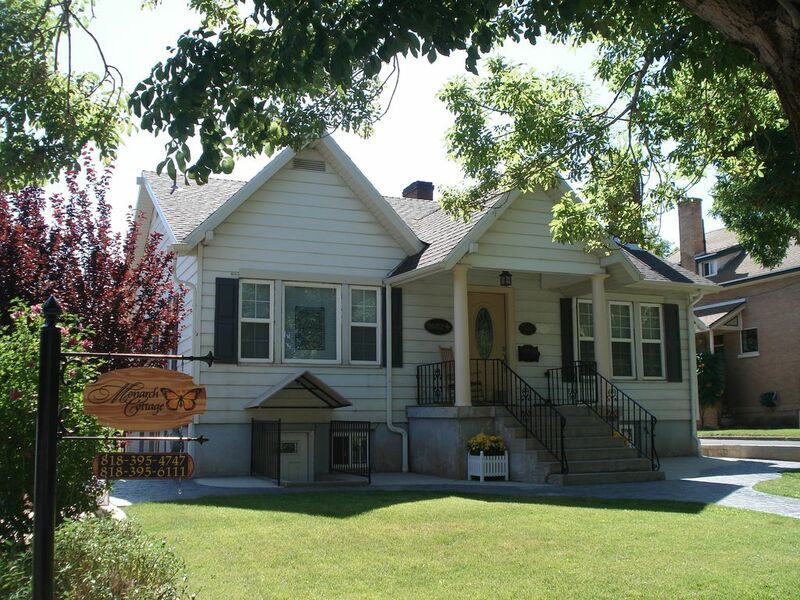 We rented this cottage so my family could visit our grandfather who lives in Cedar City. There were 8 of us and I couldn't have asked for a better place to stay. The cottage is absolutely gorgeous and had everything you could imagine right down to shampoo and conditioner in the bathrooms! The backyard is huge and has a gas grill which we used. The neighborhood is very quiet and inviting. As we checked in, the owner, Winnie, was there and took the time to explain the story behind her purchasing the home. I would definitely stay here again. The Monarch Cottage was perfect for a relaxing getaway to the Shakespearean Festival and as a nice home base in southern Utah. There were many small touches that made our stay more comfortable and that had visitors in mind. The home was very clean. Although an older house, it was nicely updated. The bathrooms were new, spacious,and stocked. Kitchens had new countertops, sinks and faucet. They were well stocked and appliances worked well. The beds and sofas were comfortable and the the air conditioning worked great. We appreciated that the place was family friendly- from my teenagers, to my baby, to grandma and grandpa. The location was perfect. The homes around are charming and it was wonderful to walk the couple of blocks to SUU. We loved that the temperature was significantly cooler than St. George where we've often stayed. In the future, we would love to stay here again when we visit Zions, Bryce, Shakespearean, or to go to Tuacahn. The only thing lacking was a dishwasher and we thought that the tap water tasted funny. Both easily remedied with hand washing and some bottled water. We grilled, watched DVD's, read books, played games, walked around the area, and spent more time at our home away from home than we ever have. It was a nice place to relax. Also, Winnie was super nice to work with and made us feel like welcomed guests to her home that evidently has a lot of meaning to her. activities. It is 5,800 feet above sea level and enjoys four seasons. miles. Salt Lake City 253 miles.